Musings, analyses and obsessions on Thedas and its characters, romances, relationships and conflicts. Please note that SPOILERS will abound for all three DRAGON AGE games. Meanwhile, meet me at the Herald's Rest and I'll buy the first round of maraas-lok! FLEMETH: I nudge history, when it's required. Other times, a shove is needed. MERRILL: It's never wise to ignore Mythal. SPOILERS as always, for all of Dragon Age! I've recently been taking a closer look at the Evanuris, both in the accepted mythology of the Dalish, as well as in the more potentially realistic (and disturbing) revelations of Dragon Age: Inquisition and its DLC "Trespasser." 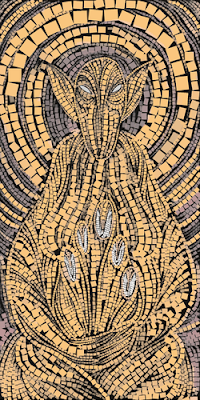 For me, any discussion or analysis of the Evanuris must begin with Mythal, whose very symbol—the dragon—is a source of fear and wonder, and which stands for the age in which most of our story now takes place. The benevolent protector of the elves who was born of the sea (the tears of the wounded Earth), Mythal, the All-Mother and Great Protector, was seen by the Dalish as the mother of the gods, the dispenser of justice and love, and the partner of Elgar'nan. Mythal brought peace, and saw into hearts and minds in order to dispense true justice, sorting the wheat from the chaff, the true from the false. Although Elgar'nan defeated the Sun (his father), Mythal persuaded him to allow it to return, and created the Moon (that most feminine of celestial objects) to reflect his light. What's interesting is that even though Elgar'nan is the nominal leader of the Evanuris, he's by all accounts, even in myth, pretty terrible at it. He starts out as judge, but this quickly becomes a disaster as his inability to control his temper means that he is incapable of rendering calm, cool justice. All his reactions seem to start at rage (I keep picturing Elgar'nan 'hulking' out on a constant basis). Eventually, it appears to me that even among the Dalish myths, Elgar'nan quickly passed the mantle of actual rulership to his mate, Mythal. I mean, he was still the ruler in name, he just didn't seem to want to do the work. With Mythal, the people could call for justice, she would listen and judge, seeing into hearts and minds, and only then would she take her judgments to Elgar'nan—which he would then dispense according to her verdicts. Until it all went wrong, and she ended either in death or imprisonment. Among the Dalish, Mythal is assumed to have been either killed by Fen'Harel or exiled with the others due to his treachery. associated with powerful symbols of the feminine divine. Evidently, the myths were true in their deepest sense: Among her fierce companions in the Evanuris, Mythal was evidently the kindest and most just, the one offering protection to her people and who constantly attempted to make and keep the peace among her arrogant and constantly warring companions. Mythal's most famous achievements were almost always those of peacekeeping. She averted a war between Falon'Din and Elgar'nan at one point, and also brought down Falon'Din (with the rest of the gods behind her) when he began to pursue war simply for even more blood and death in which to revel. Mythal also defeated Andruil after her disastrous trip to the Void (a moment that may have had lasting effects upon all of Thedas, possibly bringing the Blight) and is even reported to have defeated at least a Titan or two, although the information we get on that is both sketchy and decidedly hazy. When it comes to Mythal's deeds in the very deeps of the world, I'm interested in her ties to the Titans because I feel like there's something very obviously changed or missing there. Mythal is historically not a conquerer, even if her story is framed that way here, but then again, it also sounds an awful lot like more of the propaganda the Evanuris were so good at disseminating about those who fought them. The kind of propaganda that turned a freer of slaves, for instance, into a Dread Wolf of nightmares and cautionary tales. As far as Mythal, I just don't think she'd head down and conquer beings as vast as the Titans simply to expand the lands of the People or to amass power, since Mythal doesn't seem to be all that interested in power for power's sake. Mythal's all about the big picture. Actually, make that Big Picture. She's the one, above everyone else in the trilogy, that I feel is looking out for the world as a whole. She may be cruel at times, but it overwhelmingly appears, for the most part, that this is out of necessity (after all, Mythal is pretty forgiving and non-judgmental even if the Warden and Morrigan go so far as to kill her in DAO!). So as far as the Titans and her conquering one or more of them, my feeling is that it has to be for reasons beyond expansion or greed for lyrium; that instead, she does this because Thedas needs her to. I even wonder if she was responsible for burying all access to the conquered Titan, as a later Codex implies—if it was Blighted, she may have been trying to forestall the entry of the Taint into the world (or simply access to the Blighted (red) lyrium, a separate if parallel deadly poison). Alternatively, Mythal may have known that the elves would need this power in the future. I'll expand on this in a full later post that will simply address the ties between Mythal, the Titans, the dwarves, the Wardens, Lyrium... and the Blight. As the archetypical mother-goddess, Mythal is inherently feminine, and is associated with unshakably feminine symbols, from her birth from the sea, to her creation of the Moon itself. It is also widely speculated that the constellation Silentir may in fact represent a dragon figure (and Mythal). While some (many) have associated the constellation with the Old God Dumat over the ages, it's worth noting that the elven gods factually predate the Old Gods by millennia—in other words, Mythal came first, but as with so many elven signs and symbols in Thedas, she was once again supplanted, mercilessly, and her origins obscured once again with those preferred by the human Tevinter conquerers. the Arbor Wilds is both beautiful and forbidding. One symbol, of course, is associated with Mythal above all others: that of the dragon itself, and statues and images of dragons appear frequently around her temples and sacred spaces, both in graceful full dragon form (with massive serene, almost mournful figures depicted, heads lowered in either grief or acceptance), and in a woman-dragon form consisting of a womanly figure with dragon wings and a pointed dragon head. The woman-dragon figures are especially striking, because they beautifully reflect the duality of Mythal and Flemeth—the goddess and the witch, the woman and the dragon. The figures also evoke, for me, a strong visual echo of the Nike of Samothrace (my favorite real-world sculpture, and—true story—when I saw it in person at the Louvre, I burst into tears. Someday I plan to steal it in a nonviolent, high-stakes crime caper and to then put it in my living room, where I will sit and gaze adoringly at it until my inevitable arrest by, of course, the French detective with whom I will be having a doomed but passionate affair). Where was I? Oh, right—dragons! Appropriately, Flemeth (who carries the wisp of Mythal's spirit and awareness within her) is also able to shapechange into the form of a high dragon at will. There are also more subtle parallels—when Mythal confronts Andruil (who has gone mad after her trip to the Void), she fights her in the shape of a giant serpent (which is, once again, a frequent synonym for 'dragon' in high fantasy). 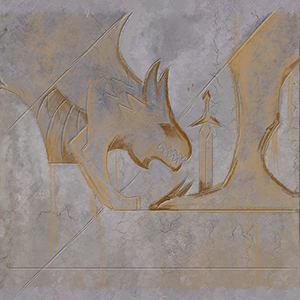 But the dragon isn't just Mythal's symbol. It is a sacred creature, a sacred form, and not only does it look like it may have been a shapeshift all of the Evanuris were capable of accomplishing, but it was also evidently an act of sacrilege for others to attempt. "His crime is high treason. He took on a form reserved for the gods and their chosen, and dared to fly in the shape of the divine. The sinner belongs to Dirthamen; he claims he took wings at the urging of Ghilan'nain, and begs protection from Mythal. She does not show him favor, and will let Elgar'nan judge him." For one moment there is an image of a shifting, shadowy mass with blazing eyes, whose form may be one or many. Then it fades. much larger point of view than anyone else. So let's look at this fascinating little tidbit: It's directly telling us some really exciting things: That shapeshifting to dragon form is a talent reserved only for the gods themselves. This could mean that all of the Evanuris were capable of the dragon shape-shift, or that (from Mythal's angry reaction and denial of protection), that it's specifically left to Mythal alone. It's not really clear, but would be a wonderful tie right back to Flemeth, and if Morrigan drinks from the Well and becomes a servant of Mythal, she is then able to shapeshift into a dragon for the final battle, just as her mother once did. However, the idea that the Evanuris are ALL able to shapeshift into dragon form also adds weight to the frequent argument of some that the Old Gods in dragon form are actually simply the trapped or cursed forms of the Evanuris, themselves, with each (Dumat, Lusacan, Razikale, Toth, Andoral, Zazikel, and Urthemiel) corresponding directly to an elven god or goddess. Of course, this also lends both motive and urgency to why Flemeth (Mythal) is so set on preserving the Old-God souls through the Dark Ritual. Which would actually be very character-appropriate, if that's the case—that Mythal wished to see the Evanuris punished, but not killed, and that she would still seek to preserve their ancient souls. It doesn't quite work for me, but it's a cool idea. 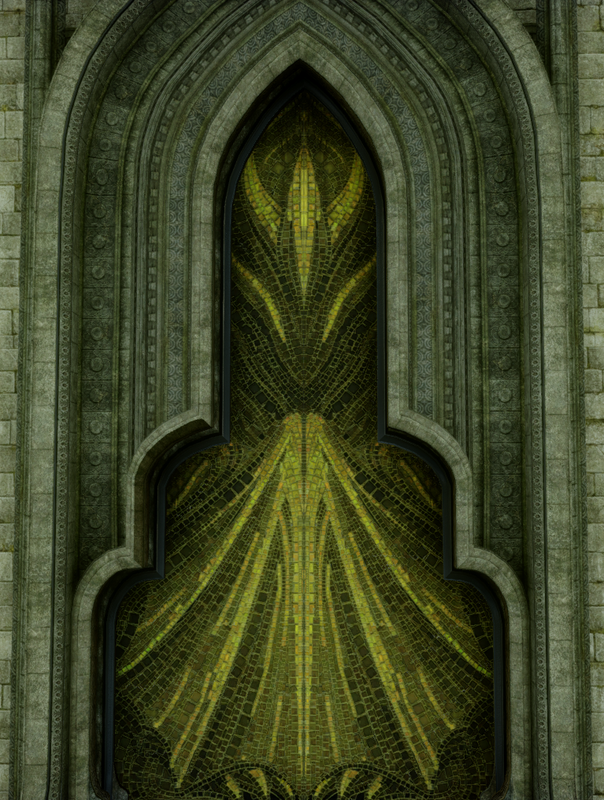 I still believe the Evanuris are, rather, together and imprisoned somewhere high in the Fade, even as the Forgotten Ones were banished to the abyss... trapped by Solas in the greatest act of retribution the world had ever seen. Let's look back again at that Codex quoted above. It's also implied, at least, according to the defendant, that Ghilan'nain goaded the 'sinner' into the transgression (which fits in perfectly with my perception that Andruil and Ghilan'nain her lover were actively opposed to Mythal). The criminal 'belonging' to Dirthamen can also be interpreted in many different ways, since this may imply that they were a follower of Dirthamen, or may even have been captured by Dirthamen. Some even speculate that the sinner was Dirthamen himself, but I don't get that at all here. "Belonging" to Dirthamen seems far different than "being" Dirthamen, after all. Then Elgar'nan's judgment there seems to curse the sinner into darkness (into the Void? ), possibly transforming them into a monstrous dark form, or perhaps we are simply seeing one of the Forgotten Ones (the enemies of the Evanuris) shifting back into his true form as he is obliterated? See how each little note or Codex seems to lead to a thousand more questions? It's all so rich and fascinating, but so difficult to pare down! (Right now, even as I write this, I have 18 tabs open on my browser, to different Codices, Wiki entries, elven language translations, and interviews with David Gaider and Patrick Weekes. Kirkwall. It's a nice spot—certainly more restful than anywhere else in the area! 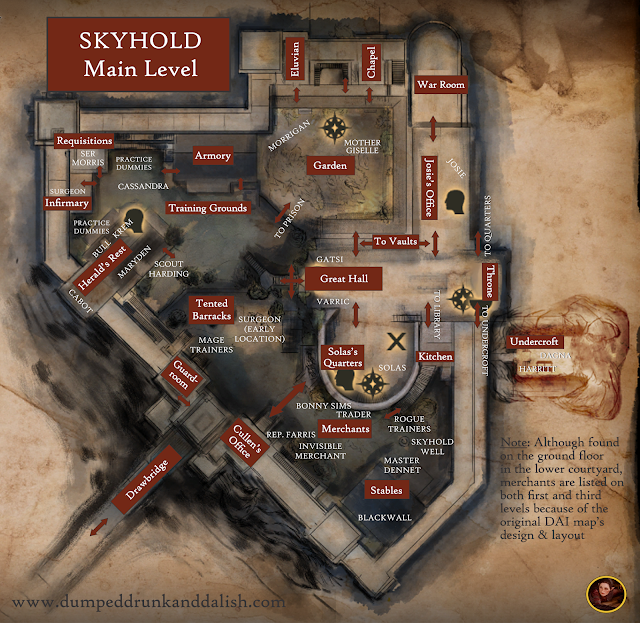 Places sacred to Mythal include an Altar to Mythal in Sundermount, outside of Kirkwall, as well as the Temple of Mythal (still guarded by the ancient Sentinel Elves) in the Arbor Wilds (also the location of a second Altar to Mythal nearby, as well as the home of the fire elemental high dragon that is the Guardian of Mythal). There are also statues of Mythal in the Tomb of Fairel and a disquieting, corrupted version in the Tomb of the Emerald Knights. And let's not forget the Well of Sorrows. Last, but certainly not least, the Well of Sorrows is a pool at the Temple of Mythal where, as Abelas reveals to the Inquisitor and Morrigan and their party, each servant of Mythal passed along his or her knowledge. This was done near the end of each servant's lifespan, for uncounted years, resulting in the Well. It's a deeply tempting object for those seeking knowledge, offering a wealth of information about the ancient elves and days, and yet, with a heavy price, as the drinker from the Well will be bound to serve Mythal without choice or consent going forward for all eternity. The Well is one of my favorite locations in DAI, as well as posing one of my favorite conundrums. To drink, or not to drink? For my first several playthroughs, I simply could not let my Inquisitors drink. It just felt abhorrent to me to willingly surrender their free will to Mythal (even if I adore Flemeth so much I'd basically fall at her feet if I ever met her). Then, however, I let an Inquisitor drink from the Well... and it's AMAZING. The benefits are immediately real and tangible. You're able to see and hear things nobody else can see or hear; you can translate things nobody else can translate. You even get some fascinating further translations on the Evanuris and (most disquieting of all) get a tantalizing hint that there may in fact be a link between Mythal and the Calling (but more on that in a separate post). Best of all, if you drink from the Well, you don't even have to fight the Sentinel Spirits in "Trespasser" (and they're pretty tough), cutting down your fighting time in the DLC by almost half. Nowadays, wherever character-appropriate, I almost always drink from the Well—it's too wonderful not to (and let's face it—no scholar or librarian would ever judge me). Yep. My Inquisitors are now forever enslaved. Yay! All hail Mythal! 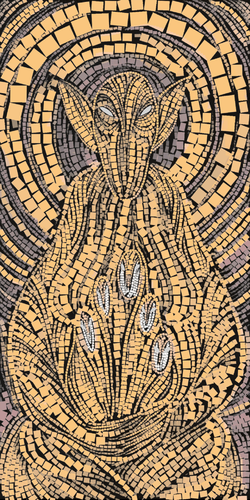 One little detail that I found interesting in the Temple of Mythal is that, in her golden mosaic portrait there, Mythal is depicted as a heavy-breasted, fertile female maternal figure with a radiant glowing halo, and whose arms embrace five little figures, for all the world like chicks in a nest. To me, this is clearly an image of a goddess holding her children, which would suggest to me as I noted in my previous post that, despite conflicting reports, in addition to twins Falon'Din and Dirthamen, as well as Andruil and Sylaise, that the mysterious June was in fact a child of Mythal's and not the husband of Sylaise. So this means it's truly a family, made up of Mythal, hubby Elgar'nan, and their five children: Falon'Din, Dirthamen, Andruil, June, and Sylaise. As well as the non-familial gods Ghilan'nain, who was raised to godhood from mortality, perhaps as the lover and mate of Andruil, and the mysterious Fen'Harel, who, as I've noted, I believe was originally a spirit and Mythal's closest friend, and who came through at her plea for him to lend her aid when she had no one else to turn to. To me, this potential family connection is vital to the big picture of the schism within the Evanuris that was to come, because if they're all related (with Ghilan'nain the beloved of Andruil and Fen'Harel closely connected to Mythal, almost as her spirit son made flesh), this adds to both the tragedy of their internal war to come, as well as to the devastating effect it would have had on Mythal. Because, if it's true, this means that Mythal wasn't just betrayed by her arrogant and anger-prone husband, she was murdered by the people she loved and trusted most—her husband and their children, who conspired together to end her life. I think for many ages (millennia upon millennia to us mortals), that there was peace and joy among the immortal Evanuris, who delighted in their gifts and talents, who loved one another, and who explored the world with passion and curiosity, each finding his or her own joys, pursuits and obsessions. As mother of her eternal and fiery children, Mythal was the judge and justice-keeper, as we know, and she did not hesitate to discipline them when they transgressed. But I think, for many years, overall, they were happy. I suspect that problems only began to arise out of sheer boredom; beings that live for thousands of years are naturally going to seek out different experiences, and I think that was a major factor here among the Evanuris. A mortal lifetime is a fragile thing of wonder and transitory beauty. But it's all too easy for me to imagine immortal beings who grew restless as the centuries and millennia passed. These were, as I've noted elsewhere, prickly, passionate and highly emotional beings. Such attributes do not point to a peaceful, ripple-free existence, especially among beings whose powers were literally godlike. I think to address that potential boredom and that sense of ennui, that they would have become seekers of ever-new and unique experiences, prizing the new and unexpected eventually above all other experiences. It's pretty easy to see the ancient elves (and the Evanuris most of all) therefore being, I would imagine, pretty flexible about such matters as sexual orientation and gender identification, even simply in a spirit of experimentation. The boredom of the Evanuris appears to me to have been in large part due to a rather myopic point of view. They were bored with the world because for them the world was an extension of themselves. People were uninteresting and only useful as potential tools, slaves, or playthings. There is no sense that they delighted in watching the progress of their world or civilization in any kind of higher sense. Just that ever-deepening sense of egotism and arrogance. This is where I think the evil crept in—the evil of arrogance and boredom, of hubris and vanity. The Evanuris were the saviors of their people, raised on high, and mightier than any who dared to challenge them. They began to believe their own stories, began to assume they deserved more, and slowly they descended into decadence and war, into ridiculous challenges and monuments simply for the momentary thrill of the experiences. This is when I think Mythal called Fen'Harel into the flesh, and I think not only did he emerge to support and strengthen her, but that he may have forestalled any tensions for many years. Bright and beautiful, and offering an almost limitless knowledge thanks to millennia in the Fade, it's not difficult to imagine that Solas would have enthralled his fellow Evanuris, and that he would have been able to help Mythal maintain peace, at least for awhile. Until the decadence became darkness. Until the Evanuris began to seek death and war for the sheer pleasure of watching the sacrifice—until they began to enslave and hunt their own people, until they began to scheme and vie for power among themselves, to hunt the darkest depths of the Void, to senselessly destroy the Titans, to (just perhaps) assail the forbidden places high and low for the delight of cruelty and pestilence. Here's when I think Solas and Mythal mounted their last, doomed effort to try to protect the People from their fellow "gods." Solas went full-on rogue, freeing the slaves and rallying the people to cast off their chains and fight tyranny. Mythal, perhaps too trusting or unwilling to abandon her family, I think kept up the fight, but from within, not without. And then they killed her. In retribution for this act, as Mythal's closest companion and friend, Fen'Harel took vengeance upon Mythal by banishing the Evanuris and erecting the Veil. Yet, even millennia later, as Flemeth admits, her spirit still cries out for vengeance. this both in tribute to the past and as penance for the future to come. 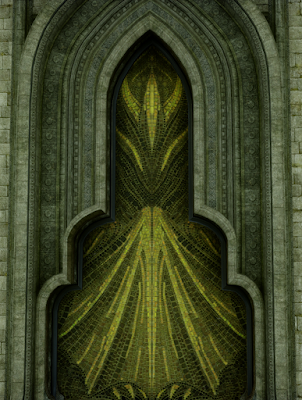 Remember that unfinished fresco in Solas's Rotunda? I've been thinking more about it. What if it's not just Solas's regretful foreshadowing of the event to come (in which he must take Flemeth's life-force, given willingly to empower him to save their people), but a flashback to Solas's discovery of Flemeth's murder? The Dread Wolf faces the body of the murdered dragon, the blade still standing in the dragon's bloody back. The wolf's head is bowed in grief. The revelation that this could be both a flashback and a flash-forward is one of my favorite little details in the entire story of Dragon Age. And I think it is. Mythal's fate is a tragic one, and it's no less tragic because she was able to find a small scrap of continued life when she joined her wisp to the consciousness of Flemeth. Within the Dragon Age universe, wisps are generally evidently limited in presence and awareness. The wisp of Mythal that Flemeth carries, however, seems to be something different—something more complex, a consciousness that not only joined symbiotically with Flemeth's, but which also enhanced her powers and awareness, allowed her to maintain an independent persona, and yet which made her something more, something greater. Someone greater. Someone who watched over the world, and gave it a nudge now and then. Someone who helped us against the Blight in DAO, and who then donned her fantastic armor and Hair Horns and outfitted herself from that point on for the wars to come (and kudos to Matt Rhodes and the rest of the Dragon Age creative team for the wonderful redesign of Flemeth's character in Dragon Age II—the Hair Horns! The fabulous armor!). essences—something sentient and genuinely complex. Flemeth's account of the experience is one of my favorite pieces of writing in Dragon Age: Inquisition—a poetic account of rage, powerlessness, vengeance, and ascension, and I transcribed it in near-entirety in this post here. Flemeth: She was betrayed, as I was betrayed—as the world was betrayed! Mythal clawed and crawled her way through the ages to me, and I will see her avenged! 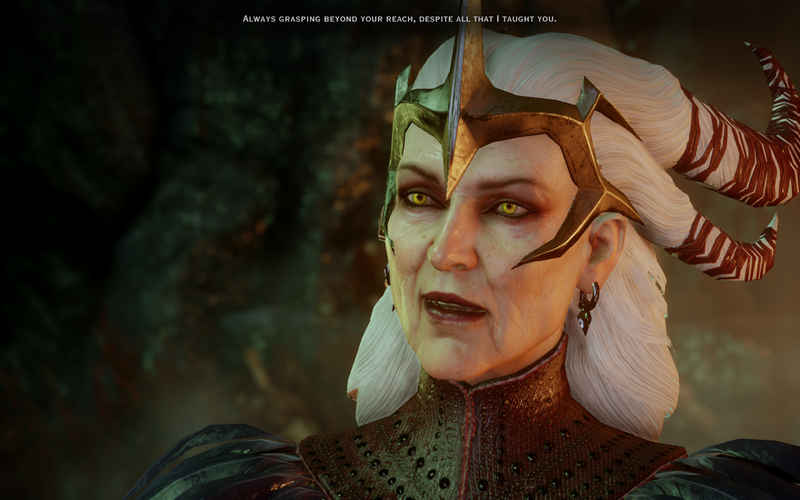 The important thing here isn't just Flemeth's anger (and the anger of Mythal that she's channeling here), but that she calls the betrayal of Mythal a betrayal of the world itself. This is a major clue, right? That Mythal is speaking for the world itself? Flemeth's words there remind me a little of Gandalf in The Lord of the Rings, actually—when he confronts Denethor in The Return of the King and reminds him, "For I also am a steward. Did you not know?" Perhaps Mythal is, in some strange way... a steward herself. A protector of Thedas—not just of its old ways or Old Gods, but of its roots and mountains, its peoples and lives. I think she might be. And if she is, she must make decisions that others will find cruel, doing so as she does from an impartial and difficult vantage point. As with her decision to save the Warden and Alistair while dooming Cailan and Duncan, among many other transitory and difficult judgments. But the love, nevertheless, is always there. The irony is, this care, this real fascination with and attention to the world at large is why I also believe Mythal was never prey to the boredom and corruption of her peers among the Evanuris. She wasn't focused inward, but outward. She didn't want to find the world within herself, but to explore and celebrate its beauty where it lay. You never get the sense, in hearing or reading about Mythal, or in talking to Flemeth, that she finds people anything less than fascinating and worth loving. She delights in being alive, both as a sensual being, and in her place as a part of something larger than herself, in serving as a vivid thread in a massive tapestry. This sense of herself as serving something bigger, however, also, I believe, contributed to Flemeth's abuse of Morrigan. Flemeth, in seeing through the eyes of Mythal, was too focused outward to be a good mother to her child. She was too busy mothering Thedas, or rather—its fate. It's always how I've seen Flemeth—that via Mythal she answers to a higher allegiance. One that is not always kind. Ultimately, Mythal's goals may be somewhat aligned with Solas's, but I don't believe they are the same. I believe Mythal cares deeply for Solas and sympathizes with his cause—after all, that final scene between the two of them is fraught with real, palpable affection and deep love. Mythal may even feel some slight (or not so slight) sense of guilt—after all, the elven people were inadvertently doomed because Solas sought to avenge her. However, I also think she sees farther and aims higher than that. I think she'll help him, to a degree (as when she willingly gives him her power at the end of DAI). But I think ultimately if it comes down to it, she will act against Solas if he truly threatens Thedas. And while I'd hate to see these two who love each other forced into a battle that could only be tragic for both of them, I also admit... the Dread Wolf versus the Dragon? Man, that's a boss battle I'd pay all kinds of money to see. Flemeth's dialogue snippets through the trilogy are both illuminating and genuinely exciting, thanks in no small part to the unmistakable performance of Flemeth's talented longtime voice actress Kate Mulgrew, whose deep, purring and instantly distinctive drawl imbues Flemeth with a real sense of dignity and knowledge that is also tempered constantly by sorrow, love, amusement, and even rage. Thanks to Mulgrew, Flemeth may hiss with malevolence in one moment, chuckle at the ironies of the world seconds later... and then cry out in regret and sorrow the next. She's gloriously complex. or caretaker looking out for Thedas? But what do Flemeth's words mean? How far is she willing to go? My take on Flemeth/Mythal is that there's a core, a foundation, of unshakable purity there. That she is, again, acting for a cause greater than herself. Dragon Age: Origins: "You are required to do nothing, least of all believe. Shut one's eyes tight or open one's arms wide, either way, one's a fool." 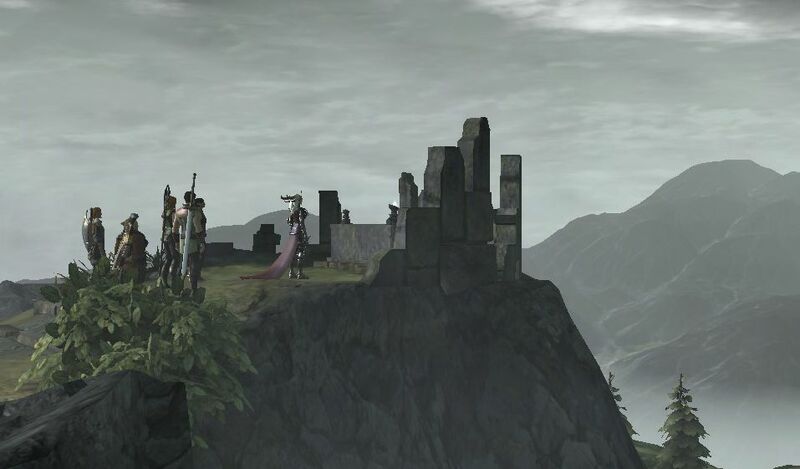 Dragon Age II: "Regret is something I know well. Take care not to cling to it, to hold it so close that it poisons your soul." "We stand upon the precipice of change. The world fears the inevitable plummet into the abyss. Watch for that moment... and when it comes, do not hesitate to leap. It is only when you fall that you learn whether you can fly." Dragon Age: Inquisition: "I nudge history, when it's required. Other times, a shove is needed." "Truth is not the end, but a beginning." These dialogue snippets are fascinating in every way. What's she really telling us? Is she warning us in a spirit of kindness or generosity? Or simply giving us an advance look at the irrevocable doom that hovers over Thedas's future? time at the spa where she got her Hair Horns of Awesomeness, dammit! We know from the legends that Mythal has taken extraordinary action before, going all the way back to the oldest days of the world, when she constantly battled her mate and her children from actions that might irreparably harm Thedas. I'll always like that she tried. And I admire that she disciplined them when their actions were terrible and impactful enough that they needed to be stopped from wreaking further havoc—that she held back Elgar'nan and Falon'Din, stopped Andruil and Ghilan'nain, that she appears to have tried to leave space for the other creatures of their world—elves, dwarves, Titans and who knows what else—to find their way. And then she died for it. But here she still is, all these years later, death or no death. Goddess and witch, elf and mortal. Ancient and eternal, maiden and crone. Death or no death, loss or no loss, Mythal never gives up. She's the woman with a dragon's spirit, the person with the eye on the big picture of Thedas as a tapestry only she can read. 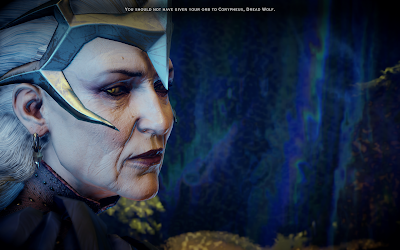 Even in her final, fateful meeting with Solas, she is wise, prepared, accepting and sorrowful. She's still trying to nudge events the right way, to help Thedas find the light. Still dancing to a song that only she can hear. Is that song really over, as Solas takes the power she offers, as she submits to at least the facsimile of death from the one being in all of Thedas who once loved, obeyed and tried to avenge her? Even as Solas gently and reverently lowers Flemeth's blackened corpse to the floor of the temple, is Mythal's story finally done? Or has Mythal's story and awareness simply been reborn, as occurred so long ago in ages past? After all, she calmly sent a wisp of herself into that eluvian before her final meeting with Fen'Harel, knowing he would appear and what would occur. Can we, from this, hope that Mythal (and hopefully still in her guise as Flemeth) will still return? Solas himself implies that death for Mythal, as "the First of his People," is not an easy matter. And what's death, after all, to an ancient goddess, but one more obstacle to be overcome? As you may remember, I wrote back in January about the status of the Veil as of the end of "Trespasser," and about my theory that for Solas's plan to eradicate the Veil to succeed, in actuality, all he really has to do is... wait. In the latest version here, I have updated my original map to reflect additional key locations in Tevinter, the Anderfels, the Storm Coast, the Hissing Wastes, the Blackmarsh, the Lost Temple of Dirthamen, Seheron, and a few others that I missed the first time, and which some fantastic folks on Twitter were nice enough to point out. I also clearly marked every mage circle location specified across Thedas (note: with the exception of the one in Antiva that's never specified as far as city). Beyond Solas's ancient elven artifacts (which I do believe will genuinely help to strengthen and ward the Veil), I did a bit more research and reading, and there is, however real evidence that it's possible to further heal at least some of the Veil tears we encounter across the story. For instance, in Dragon Age: Origins, a demonically possessed Sophia Dryden can openly heal a major Veil tear right in front of our Warden at Soldier's Peak, in a bargain with the Warden for her freedom. In the "Awakening" DLC, meanwhile, several spirits and demons are presented as actively keeping or holding Veil tears open. The Warden-Commander can then repair those by killing the demons or spirits responsible. In the Dragon Age II "Mark of the Assassin" DLC movie spinoff Dragon Age: Redemption (about the further adventures of an elven Ben-Hassrath named Tallis, played by Felicia Day), a Qunari Saarebas is able to tear the Veil by using an artifact of the Dalish known as the Mask of Fen'Harel. By destroying the mask, Tallis is able to close the impending rip in the Veil. These instances seem to be rare, however. 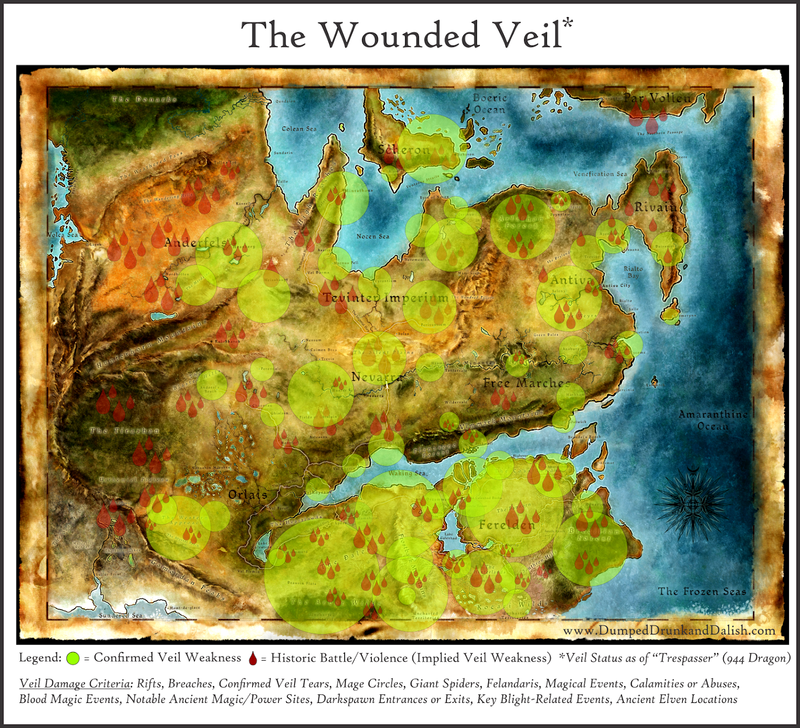 In one of the Codices for Dragon Age: Origins, First Enchanter Wenselus is quoted as saying "Once the Veil is torn, it is extremely difficult to mend, some say impossible." Still, I continue to believe the Veil is doomed... I even continue to wonder if that's why Solas hasn't acted at the end of Trespasser. As I've noted in my Character analyses on Solas and his romance, I do think he's conflicted, and I don't think he is truly prepared to tear down the Veil and doom the world, flawed as it is, that he's grown to care for (much less the people he loves within it). And let's face it... if I'm right, he won't have to anyway. The Veil is shredded. And I suspect it's actually in far worse shape across Tevinter than I'm showing here, simply because I feel like we have so little information about it as a location in general. But their use of blood magic is rampant and goes back ages, and it's a triple-whammy in terms of thinning the Veil because of the (1) magic use, (2) blood magic, and (3) death and bloodshed. One of the other things I want to add in this update is that I realized upon further research that the Mage Circles across both Orlais, Ferelden and Tevinter weren't just locations where the Veil went thin through magic use (and in many cases, bloodshed). They were in fact chosen, in almost every case, because they were places where the Veil was already thin. Which is interesting because that's certainly more dangerous for mages and increases the potential for Abomination. In other words, it's evident that the need for power supercedes the risk of Abomination, and I suppose I can see that when a Blight comes calling—that it's thought to be worth that risk to increase magic potency and strength even if the danger to the lives of mages went up. But then again, that's the tragedy, isn't it? Historically, nobody really values the lives of mages. They're simply tools, weapons to be kept locked away until it's time to use them. The important thing is, this means that we started with a thin spot for each and every Circle. For each of the most important cultural Tevinter locations where magic use was involved. For each key ancient elven location. And then it just proceeded to get thinner. In other words, it's not looking good for our friends in Thedas—I'm guessing from what we're looking at here that the Veil has less than a millennia of life left to it. Maybe even just centuries. Or maybe it's already poised to go up in flames, a potential bonfire just a single match away from conflagration. Will Tevinter light that match? Or the Qunari? I still don't think it will be Solas. Meanwhile, what do you think? And did I miss anything else here? Are there any other factors I should include here? I'd look forward to your input, as always! I love great fiction, from literature, to TV, film, and gaming, and am especially passionate about fantasy, science fiction, and the search for magic in our daily lives. I'm the author of several works of fantasy that you can purchase for your Kindle now, including The Bridge, Falada, Dancing Days, and The Betrayals of Women—learn more at my Amazon author page (and if you like what you read, please do leave a review!). I also write Dragon Age columns on occasion for The Fandomentals. Meanwhile, thanks for visiting, sharing and commenting—I'll look forward to your insights! This is by no means a complete list, so please accept my heartfelt thanks to all of you who support, visit, read and talk about my posts! I don't take it for granted. The Parallel and Paradox of "In Hushed Whispers"
Celebrating Dragon Age Worldwide with Dragon4ge Day 2018! Reader Questions: God or No God? Everybody Sings! The Importance of "The Dawn Will Come"
Meaningful Banters: "I'm Onto You"
Sing a Song of Solas: Solas Dialogue and "Hallelujah"
All articles © Angela D. Mitchell. All images courtesy of BioWare. Watermark theme. Powered by Blogger.